The redevelopment of Sompting Close housing estate enabled two art projects involving residents and two projects in local schools. 'White Horses' is a steel sculpture of horse figures in cantering and jumping poses and is the entrance piece for the development. Local artist Stig Evans made the sculpture out of white powder coated mild steel. This uses local and traditional methods and provides a visual link to the racecourse which is the backdrop to the new development. Working alongside the theme of ancient and modern downland chalk horses, the intention of the sculpture was to bring attention to the unique geographical and historical aspects of the area. Acting like a sundial, the sculpture reflects the passage of time as the cast shadow changes through the day and year. 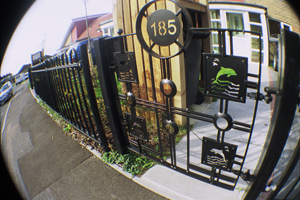 The other project involved residents designing their own front gates in conjunction with metal work artist Noah Taylor. Noah ran workshops for families to attend where they viewed some of Noah's previous work and talked through ideas. Residents had a choice of three frames and then designed their own central patterns. This project was based on the tradition of naming properties to give residents an immediate sense of connection to their new environment. The end products feature a number of different designs including dolphins, lions, cats, horses, a Minotaur and the Panamanian flag. 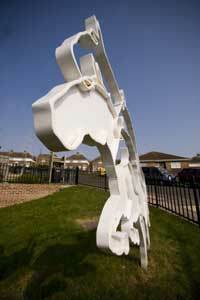 'White Horses', as a sundial, fits with a human sun-clock commissioned at the local primary school, St. Mark's. The student's images were sandblasted onto the granite slabs and set into the school grounds. The techniques used in the school complemented the techniques used in the sun-clock.